Relaxing My Hair Tonight! 3 Months Post - Hairlicious Inc. I've officially hit 3 months post relaxer! It all goes down tonight. I based my scalp with Hollywood Beauty Castor Oil (new formula) and I applied it to my previously relaxed hair (from the new growth down) to avoid overlap. I prepare my hair by pre-parting it in thin sections so that the process goes faster and evenly. The twists help to keep the hair in separate sections.The Sprush helps tremendously. I have two so that my sister can use one on the back of my head (I relax the front). I set the timer to 25 minutes but I always finish with 5-10 mins to spare. When I'm done, I unravel all the twists and head to the shower. I plan on doing a mid-protein step (which I've never done before) with Affirm 5 in 1 Reconstructor for approximately 2-5 mins then neutralize (20 mins) with Motions Neutralizing Shampoo. 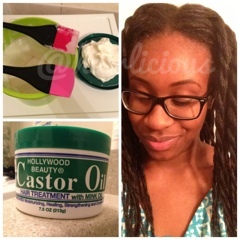 Do you put the castor oil on all of your hair or just at the scalp parrt of the sections? I put the Hollywood beauty castor oil down the length of my hair and I based my scalp with it. Yay! I will be relaxing too in a few days which will make me 3 months post. Just a question, how is your shedding doing? Awesome!! My shedding has decreased tremendously. Thanks for asking. I did the black tea rinse last week and the shedding has minimized a lot. Otherwise I wouldn't have relaxed my hair. Did you get your shedding under control Sunshyne? Definitely. Thanks for asking hun. More details to come. You're lucky that you have someone to help you so that you don't do the half and half method. Have you ever had to do it yourself? Have you ever mixed oil with your relaxer to reduce the degree of straightness you achieve? Having my sister do the back of my hair has been a great help. I've never done it myself. I don't add oils or conditioners to my relaxers either. I relax for 20-25 mins with a normal strength relaxer (ORS Olive Oil) and that's it. My hair never comes out bone straight, which is what I prefer. I'm glad I found this thread about how you relax and what you use! I had tried to message you on an older blog about this, I plan to self-relax in 2wks and really like your tips and pointers. I am currently 10wks post-relaxer myself and have noticed significant growth and length retention since following a regimen much like yours. I have shoulder length hair as I am beginning my hair growth journey.thanks for the tips and keep on sharing! How did the Mid-Relaxer Protein treatment go? How much growth do you see when you stretch for 3 months? when you say you relax for 20-25 minutes.. that 20-25 minutes start after you fully applied the relaxer or do it start when you first start applying the relaxer? Beautiful results as usual Sunshyne! I self relax bone straight but want to begin texlaxing. Do you smooth your hair after applying your relaxer? If so, do you use your fingers or sprush?